Two stage extruder pelletizing line with 1000kg/h capacity and good mixing has many different series and types of machines,all just according to the customer's needs. Enforcing modification PE,EVA etc.+CaCO3 ,talc,TiO2,carbon black. Degradable master batch:PE,PS etc. + starch,additive etc. Anti-flame master batch :PE,EVA etc. +Sb2O3,Mg(OH)3 etc. 1. 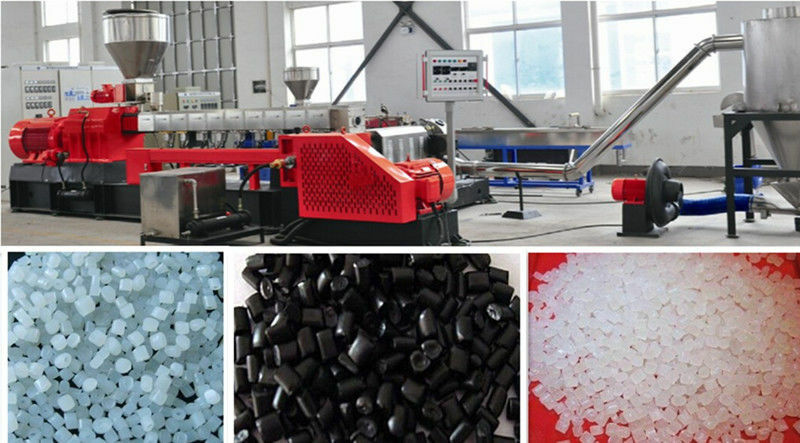 Stage 1 is co-rotating twin screw extruder, which makes use of twin screw high speed, high shearing and strong compounding advantages to have material compounded in a shorter length of stay and finished compounding process under no die head back pressure. 2. Stage 2 is single screw extruder. The screw low speed and deep slot provide low shearing process environment, which prevent the compounded material from decomposing because of overheat under high pressure. 3. The raised operational flexibility and accurate temperature control do facilitate realization of different technological processes, maximally enhancing production efficiency.